Is everyone in the family in agreement about raising a Service Dog? Are there any smokers in the residence? Does anyone in the residence have a felony conviction? Is your employer/school in agreement to permit the Service Dog puppy to accompany you? Do you have other Dogs or Pets? How do your personal Dogs react to other Dogs? Please tell us about your history of dog ownership, types of dogs, what became of them, obedience training completed etc. Where will the puppy be kept when you are not home, or unable to directly supervise? Where will the Puppy’s crate be kept? Will you agree always to keep the puppy on lead or supervised within an enclosed area when it is outdoors? How do you plan to exercise the puppy? Do you have reliable and suitable transportation? Are you able to commit to meeting for training and socialization twice per month with our Trainers? How often will you be able to take the puppy out for socialization and training in public (outside of group meetings)? What sort of stores and public places will you expose the puppy to? Do you have permission from your landlord to have a puppy/dog? 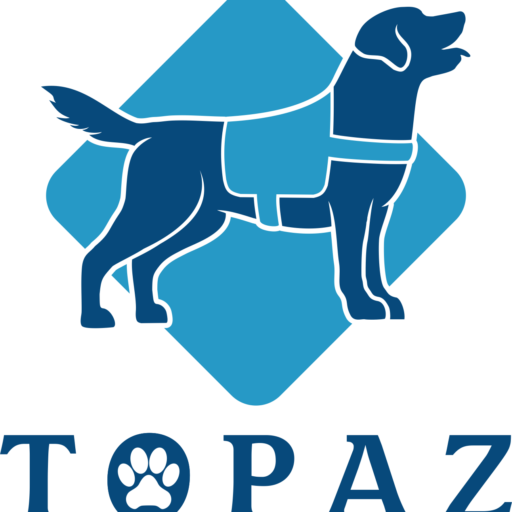 Are you willing to follow all of Topaz Assistance Dogs’ rules and recommendations? Are you willing to document the puppy’s training with forms provided? Please tell us why you would like to raise a Topaz Assistance Dogs’ Assistance Dog puppy? Do you feel you will be able to emotionally handle the separation when the puppy is returned to Topaz Assistance Dogs for formal training and placed with a Client? By signing below you affirm all information provided is true and correct to your best knowledge. Falsifying information may cause your application to be revoked. Please understand that whenever you voluntarily disclose Personal Information online this information can not be guaranteed to be one-hundred percent secure and, in some cases, that information can be intercepted, collected and used by others. However, we work hard to protect your Personal Information at all times. Your information is stored on a secure server that T.A.D. and its authorized personnel can only access through a password. Additionally, we encrypt your information to prevent third parties without authorization from intercepting your information when it is in transit to us. By completing and submitting any application, form or contact to us, you acknowledge receipt of this policy and consent to the electronic delivery of such disclosures or communications. Such information may include some or all communications about your application status. Please read it carefully and print and retain a copy for your records. The decision to correspond, share or submit information with us electronically is voluntarily yours. You are voluntarily and optionally providing medical information through T.A.D. online form submissions, if you prefer not to submit such Personal Information electronically please contact us via phone call prior to submitting any forms on our website. Personal Information may also be collected, or your IP address logged, when you visit T.A.D. website. Your IP Information allows us to understand how you use our site and enable us to make changes to our site in order to improve your experience. Information regarding your computer, your connection to our website (such as your browser type, operating system, and platform) and your user history (including, but not limited to, your session information, page errors, and the length of your visits to specific pages within our website may also be collected. How We Use Your Personal Information. T.A.D. may use the Personal Information you provide for purposes such as: evaluating need and program qualifying information, registration, fulfilling your request for services and communications, improving the quality and overall look of our website and services, contacting you or reference contacts provided by you, conducting research, providing anonymous reporting for clients and potential clients. T.A.D. may also retain the details of any transactions, donations, or payments made with us. How Your Personal Information is Disclosed. It is T.A.D. policy not to disclose, sell or rent your Personal Information to any individual, business, government entity or outside parties except: (i) to provide products or services you've requested through us; (ii) in response to a validly-issued subpoena, court order, or other legal process; (iii) when necessary to establish or exercises our legal rights or defend against legal action; or (v) where you request T.A.D. to do so. T.A.D. may use return email address to answer the email or form submission we received from you. Any communications or disclosures related to your request may be provided to you electronically through our website and/or email. Your Personal Information will not be collected for use that is in violation of the law, or unrelated to the information discussed in this Policy, unless you are also provided an opportunity to opt-out or otherwise prohibit such unrelated uses. Correcting Your Personally Identifiable Information. You are responsible for ensuring that all Personal Information you provide on the website or any correspondence is maintained and kept current. Scope of Consent. You consent to receive disclosures and to share, correspond and submit Personal Information electronically. The information and disclosures may be provided electronically: the agreements and disclosures for all services you elect to use; all communications, protected medical information, future amendments, and all notices of approvals, acceptance, changes, suspension and restriction. From time to time, we may use this information to better design our website and to share with select advertising partners, sponsors, and/or affiliates however IP addresses are not linked to Personal Information. For example, we may tell an advertiser X number of individuals visited a certain area on our website, or the Y number of men and Z number of women filled out or application or contact form, but we will not disclose to these partners or affiliates anything that could be used to personally identify those individuals. Electronic Records. To facilitate electronic commerce, to reduce the expense of records storage, and to obtain the benefits of faster access to records, you acknowledge and agree that we may in our discretion store all records electronically; and that we will not retain and have no obligation to retain any original documents for any period of time. This applies to all documentation including but not limited to preliminary or full applications, emails, client status, notes, and/or private medical information and security documentation. You further acknowledge and understand that we will routinely destroy all original documentation for the respect and safety of your personal information. We may store records electronically via imaging, scanning, filming, cloud storage, USB or any other technology used for the storage of documentation via internal processes or third-party processors that we approve for these services. "E-Mail" and Facsimile Communications. You acknowledge and agree that the Internet is considered inherently insecure. Therefore, you agree that we have no liability to you whatsoever for any loss, claim or damages arising or in any way related to your submission of Private Information or our response(s) to any e-mail or other electronic communication or form, which you knowingly and voluntarily have submitted to us for review and processing. We have no duty to investigate the validity or to verify any e-mail or other electronic communication; and may respond to an e-mail at either the address provided with the communication, or any other application or written communication actually received by us. You expressly consent and agree to us, our agents or any associated parties we authorize sending and your receiving any communications here under by facsimile or other electronic methods including any or all correspondence, sharing or sending of Personal Information. Scope of this Policy; Third Party Websites. Although this policy applies to all the information obtained by you for the purposes of assessing or using content controlled and owned by T.A.D., it does not apply businesses or entities that are not owned or controlled by us. This website may contain links to other third party websites. Please be aware that T.A.D. does not claim any responsibility for the privacy practice of these third party sites. We encourage you to be aware when you leave our site and to take reasonable precautions when sharing your personally identifiable information on third party websites. Opt-In Policy. You may "opt in" to receive newsletters, fundraisers, and other useful information from us. To unsubscribe from our mailings (except important system and content update information), you may select "unsubscribe" from the email sent. Amendments. T.A.D. reserves the right to amend this policy at any time. T.A.D. will contact registered users by email, and shall also post notice of change on its website, when and if the terms of this policy are amended. Private Information. By submitting any form, contract, or communication through the T.A.D. website or email services you acknowledge you are doing so voluntarily with the understanding that the Internet may not always be secure or safeguarded in protecting your private information, including but not limited to medical information. If you are concerned with submitting or sharing any information electronically please contact us at the address or phone number above for alternate process. If you do not acknowledge & accept the disclosure, please note that your application can not be submitted.